One might think that the Oresteia, Aeschylus's trilogy of blood-soaked tragedies, would have been adapted as opera more often. I know of two complete settings, by Sergei Taneyev in Russian and by Washington composer Andrew Simpson in English. Darius Milhaud's electric and pulsating score, over two hours of it made from 1913 to 1923, is not a setting of the complete text. The first two parts, a small section of Agamemnon and a slightly larger portion of The Libation Bearers, were created as incidental music for a staging of the plays by Jean Cocteau. 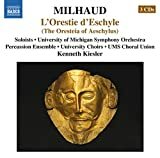 Milhaud made the third play, The Eumenides, into a complete opera, and this new recording from the University of Michigan School of Music brings together all three of the pieces, which trace developments in Milhaud's style. We do not get the chance to review Milhaud's music all that often, especially live. While the recent performance of his one-act opera Le pauvre matelot was a little underwhelming, the brutalist force of these three pieces is not to be missed. The influence of Stravinsky is heard, especially in the little choral scene of Agamemnon, with its motoric melodic cells repeating over and over again. Much of the music sounds cut from the same cloth as Satie's Socrate, composed around the same period, but more daring sounds come into play in the second and third parts. Milhaud calls for a form of rhythmic speaking, pulsed by percussion, in the creepy Omens section of Les choéphores, something that might seem boring or weird but is riveting when realized. To capture the immortal sound of Athena's voice in Les euménides, Milhaud writes the part for three women singing simultaneously, performed memorably here by soprano Brenda Rae, mezzo-soprano Tamara Mumford, and contralto Jennifer Lane. The performance is good, if not quite great, at its best in large textures. Mr. Stroe died in exile Germany in 2008.